Time for the Day 6 Giveaway! 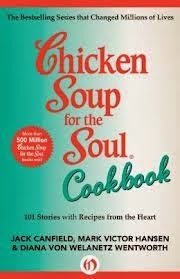 Today's giveaway is an ebook of Chicken Soup for the Soul Cookbook. About the Book: The kitchen is the heart of the home. So much of life is lived around the family table: We tell stories, review the day, pass on traditions, grieve our losses, resolve differences, introduce new loves, and celebrate holidays. In the preparing and sharing of meals we create deep memories that we carry with us forever. To enter just fill out the form below! Thanks! Giveaway ends December 22, 2013. I'll notify the winner via email!